"Icons on the Desktop" is a common request, and there are many ways of getting them if you want to complicate the austere BL non-desktop. The best choice depends on why you want icons, what you already have installed, your taste in configuration tools... For example, if you want .desktop files to launch applications with, then maybe a better option is to look at some kind of panel, like xfce4-panel, or tint2 launchers, or even jgmenu. Again, many many options. *) It's from the XFCE family so will get along with our file manager Thunar. *) It gives you some control over how icons are displayed, and their captions. *) Allows similar control of wallpaper display to nitrogen, including different wallpapers for different desktops. *) Doesn't bring in as many dependencies as eg Nautilus would. *) As a bonus, you get a dynamically-updating right-click applications menu. Note the package name is xfdesktop4, but the command to launch it is xfdesktop. The need for sleep is explained later. 1) The openbox menu will no longer be available with a right-click on the desktop, except over the tint2 zone, but of course the keyboard shortcuts [Super] or [Super]+[Space] still work. Personally, I never found clicking the desktop convenient anyway, considering it's usually covered by a maximized window. 2) Conkys with own_window_type = 'desktop' will disappear if you click the desktop, never to return! The fix is to edit the conky file to own_window_type = 'normal'. 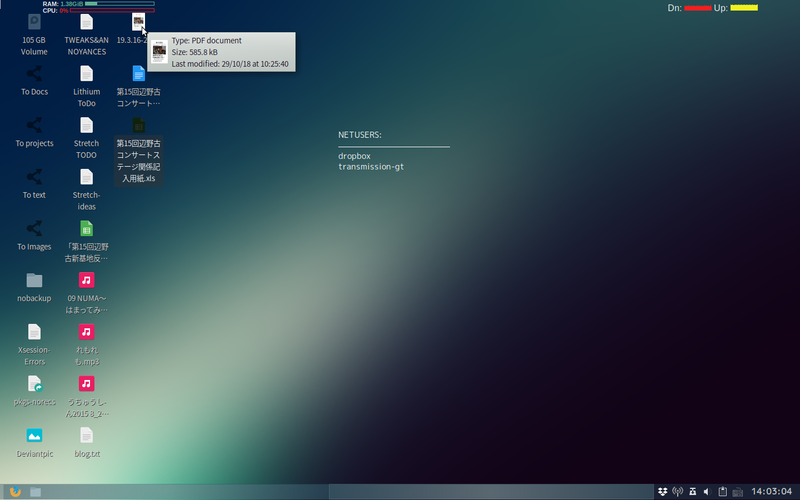 That means that pressing [Super]+D to show the desktop will now hide the conky. I don't think there's any way round this. 3) The current Stretch package has a bug which prevents opening of non-default folders to choose a wallpaper. Download xfdesktop4 and xfdesktop4-data 4.12.4-2 from Buster, and install with gdebi. Not recommended in general, but works in this case. Alternatively, wait for an upgrade to the Stretch package, which the Debian devs seem to be working on. 4) The default display of text under the icons might not be to your taste, but it can be tweaked by adding some code to ~/gtkrc-2.0.mine. See /usr/share/doc/xfdesktop4/README. Here's my code, to give you an idea. I tried to make the text match conky as closely as possible. At shutdown, store the current (presumed correct) icon positions. [[ $i -nt $candidate ]] && candidate="$i"
Once all that's done, everything should work nicely! Thank you John for that comprehensive explanation. Does setting own_window_type=override fix the show desktop issue? Then the user can use those in the application settings of the openbox rc.xml file. Thanks for the idea. I'll try that out in a day or two - I don't now remember if I checked out all the variations or not. Anyone else, feel free to go ahead though, if you don't want to wait. 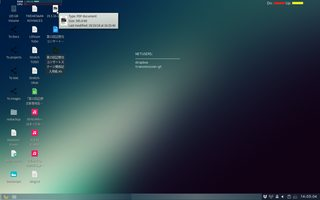 the conky vs. desktop manager problem is age-old and there doesn't seem to be a satisfactory solution to it if the desktop manager isn't willing to recognize conky's special role. Conkys with own_window_type = 'desktop' will disappear if you click the desktop, never to return! will get around that by placing the conky window in the openbox dock. Downside is that openbox is hard coded to draw a border around docked applications, and the conky window is placed wherever the dock is positioned. You can sort of hide the border with a background - including a semi-transparent lua background. I suspect setting the border to "0" in the openbox theme will do that as well. The dock can be set to be below windows. So there is a fix for the issue depending on your priorities and what you can live with aesthetically. since it's not a window, conky will not iconify with the ToggleDesktop action, but conky will not be visible if you're running compton. How easy is it to backport the xfdesktop4 in Buster or Sid? Hopefully to deal with the bugs mentioned? Thank you for these explanations. Do you know how to choose the folder whose content will be displayed on the desktop ? It looks like, by default, it is my personal folder and the result is a bit messy. Right click > Desktop settings (or whatever the english version is named) does not help, nor does man xfdesktop. Edit : found ! You need to open ~/.config/user-dirs.dirs and set up the XDG_DESKTOP_DIR= value.